Our New Therapy Laser is Here! Our new laser will provide even better results with shorter treatment times. 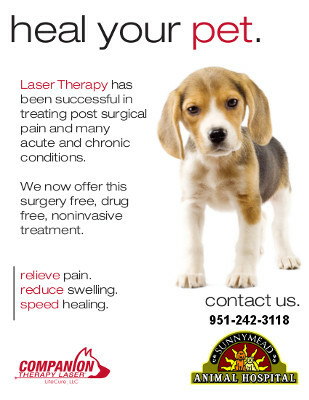 Visit our Laser Therapy Page for more info. Now you can take a virtual tour of our hospital! You can click on any room on a map of the hospital to see photos and a short description of that area. Tour Sunnymead Animal Hospital now. On 6/9/15 at the Moreno Valley City Council Meeting, we were honored by the city with a Spotlight on Business Award. Dr O, addressed the chamber and was presented with a certificate and a DVD of a 30 second tv spot that the city made for us. Thank you for your support Moreno Valley! Here is Dr. O's TV debut!